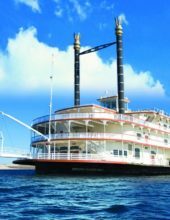 Showboat Branson Belle Ticket + Hotel Package Deals! Get HUGE savings when you book your Showboat Branson Belle tickets + lodging together! Experience the famous Showboat Branson Belle, dinner, show, and sightseeing cruise on Table Rock Lake! Get a show, meal, lodging, and more with these vacation packages that include tickets to the famous Showboat Branson Belle! You save up to: $256.75 (63%) off! You save up to: $156.75 (39%) off!